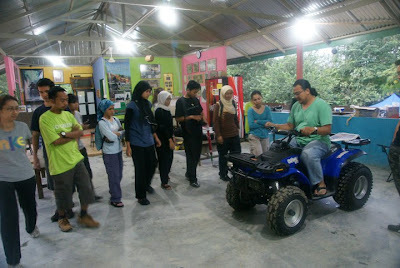 ATV (all terrain vehicle) at Kemensah (further down Zoo Negara). What's an ATV anyway? Here's a short description of it: It is a vehicle that travels on low pressure tyres, with a seat that is straddled by the operator, along with handlebars for steering control. The rider sits on and operates these vehicles like a motorcycle but the extra wheels give more stability at slower speeds. 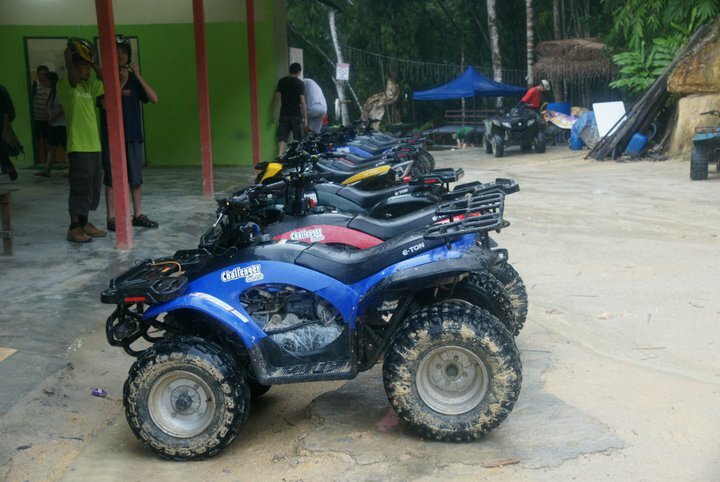 The ATVs that we used are automatic transmission vehicles - no clutches, hurrah! (I have not driven a manual car since taking my driving license!). There is only front, neutral and reverse gears. The gas (accelerator) is on the right handlebar, the brake at the right handlebar is for the rear wheels, the left one is for the front wheels. This time around we were missing 2 head honchos of PEERS recreation committee Zu & Shawn due to domestic causes. Wish you were here! To pass the time, me and Diba (Limau's wife) made a splash at the swimming pool (yes, there is one here!) The water is from the river here. We started our briefing at around 5.30pm when it started to rain heavily. It was intermittent really, the rain- it rained cats and dogs at one time, then receded, but it rained heavily again. 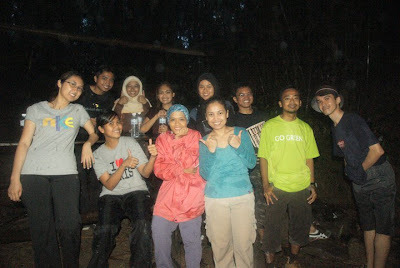 There were 16 of us (4 didn't show up), so we were divided into 3 groups. Being with Liza, she wanted to be in the second group so she could see how the others were doing it first. I picked up the bimbo-est helmet (a pinkish flowery one!) We were told there would be two 45 degree hills; we should just press on the gas and not lose momentum during the climbing. We were told not to try to balance the ATV like a motorcycle as it is designed to traverse rough terrain (hence the name ATV). We were given the chance to practice first and made a few rounds. I was quite lousy during the practice session (still nervous). Then we were ready to go! I was the first to go in our group. I was so nervous that the guide decided to climb on my ATV and drove me down instead! (We started by going downhill). It was a slow start for me, still trying to familiarise with the machine and getting the hang of it. Both times during the 45 degree climb, I asked for assistance. At one point, I stuck out my foot to balance the ATV like a bicycle / motorcycle. Hah! 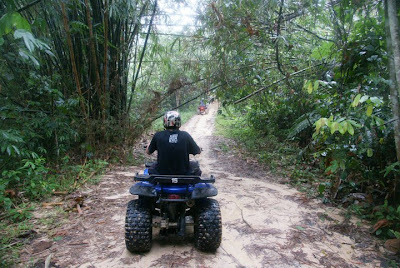 The guide was right after all – he already told us not to, the ATV would balance itself. Still not confident enough. Our halfway point was the Air Terjun Sofea Jane – according to Limau, this was where she acted a scene from the film Perempuan, Isteri & … Because it was already 7pm by then, it was dark and cold, so we didn't spend too much time there. 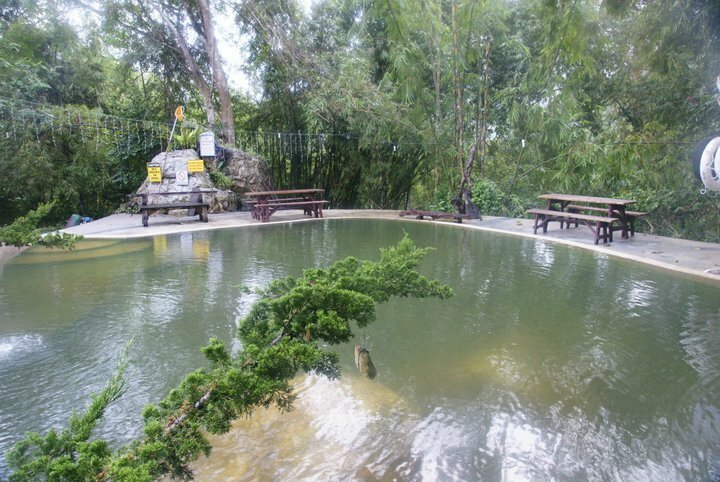 Limau mentioned it'd be awesome if we could have a picnic of piping hot maggi by the waterfall. Ah suddenly I felt hungry at the mention of food! We reached back base at 7.30pm, washed up, solat and ready to roll for dinner! 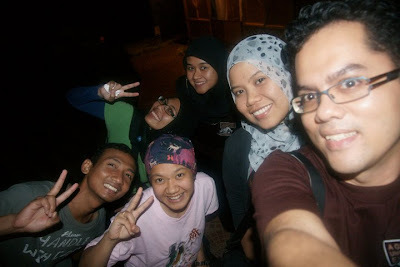 But by the time, most of the participants had already left, so there was just 7 of us remaining. We headed to Istana Bambu by the MRR2 for dinner - it was an excellent choice! Great ambience, good food and good company ;-) Loved it! 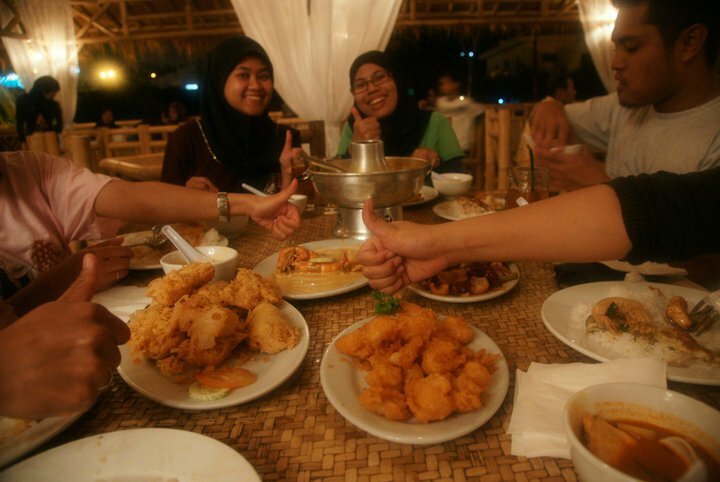 We ordered quite a lot – butter prawn, fried calamari (nama glamer sotong goreng tepung), tom yam, dried chilli chicken and fried tofu. I especially love the tofu (I love tofu!). All cost about RM160 (about RM23/person). Not bad at all! Feeling full, we then head back to our nests and called it a day. Note: All pix courtesy of Razeif. Thanks Razeif! 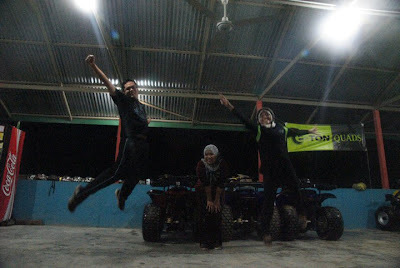 funtastic! but my upper body sakit2 sket. hehe. maklumla jarang exercise. nih kalo wall climbing mau lagi flat!